I have always admired those who are able to draw and paint. It is a wonderful gift to have and something to be appreciated...both as the artist and as one who admires the art. Mommy and I have a friend who is a very talented artist. Mary Watts has been painting for over 10 years. She loves painting portraits of animals, especially dogs. She paints mostly from photographs, sometimes combining different photos for one final painting. Here is a painting of a sweet dog named Lacey. It looks like you can just reach out and pet that face! This beautiful dog here is named Suzi. She did a fantastic job of capturing the expressive face of that beautiful dog. With all that talent coursing through Mary's hands, I was very honored to have Mary paint my portrait recently. I was so excited I could barely contain myself. This is my first ever piece of art done of me. I felt a bit like a celebrity Pixel! 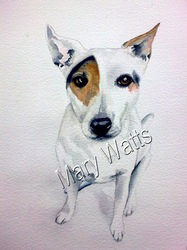 You can visit Mary Watts website by clicking Mary Watts Pet Pawtraits. I know she would LOVE to see you visit her site. Tell her that Pixel sent you! And now, the one I know we all have been waiting to see....the portrait of me! 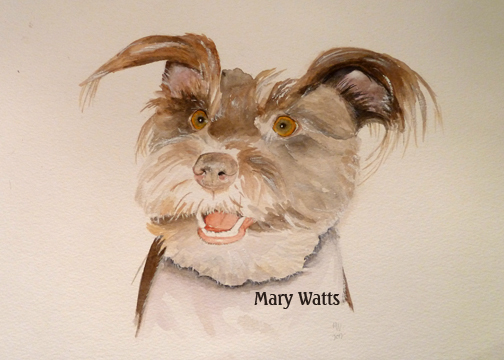 Mary Watts painting is a beautiful capture of my eyes, joyful smile and happy ears. I am just thrilled with it!! Thank you sweet Mary Watts, for doing such a beautiful painting portrait of me. Please leave a comment and let Mary and me know what you think. 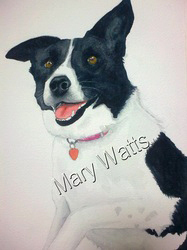 Also, please visit her site at Mary Watts Pet Pawtraits. Pixel.....that is a beautiful painting of you....have you seen my blog event for my 2nd Birthday???? This painting could be your key!! Wow! Your friend sure is talented! Incredible artwork! Your portrait is fabulous! The story about the glove is scary...thank goodness you made it through that! What marvellous paintings! Nice to meet you pixel, that's a wonderful painting of you, bet it's on the wall now!